We used to call it the 'Rule of Threes': a human being can, on average, survive for three minutes without air, three days without water and three weeks without food. Which, in a way, puts things into perspective for athletes like us who indulge in endurance sports. Air; well we pretty much take that for granted - issues with the air quality at some venues notwithstanding, but water and food are topics that should be pretty much at the forefront of our minds when we plan for a race. Over the years I have been repeatedly amazed by the number of people who, just weeks (or even days!) before a major race have asked about nutritional strategies. But this article isn't about food; it's about the other question - the one that never gets asked: hydration. Why, when it's so much more important than the nutrition issue, does nobody seem to take any notice of it? Most people understand that, after around two hours, the body has exhausted its supply of glycogen and unless you've trained it to burn fat efficiently you will be getting into the territory that's known as 'hiting the wall' in running or 'the bonk' in cycling. That's why you see all those long-distance triathletes loaded up with energy bars, gels and the like when they head off on their training rides or races; it's all part of a desperate attempt to replace the energy that's being burned with new stuff. In reality it's a futile attempt because the body can't absorb enough to replace what's being used in real time - it's actually all about managing the resources that you have and using them efficiently (ie burning fat, of which we all have plenty, to extend our 'range'). What most people don't seem to understand is that managing your fluids is even more important. Without a correctly hydrated system your performance will start to drop off - no matter how much fuel you have on board. The average human is little more than a bag of water with some calcium implants to hold it all in shape; up to 70 percent of our body is water with muscle being about 75% water, fat about 50% water and even those bones are about 50% water. That water is essential for all the correct internal operations, right down to the cellular level. If there isn't enough water then those processes just don't work properly. OK, so having set the scene, what can you do about it? The most obvious answer is to make sure that, no matter how short the training session or race, you take on fluids. Figures vary wildly depending on which source you read, a quick search on Google will turn up dozens of scientific studies on the subject. Not all of these will agree, but a good rule of thumb is that, unless we are talking about a 'melt-down' race like Windsor in 2005, you should be OK with around 800ml per hour here in the UK. What's also important is what you drink; plain water isn't enough, you need to get some electrolytes in there as well, and over the last year or so we've had some new players arrive on the scene which claim to offer the hydration but without the other stuff. Unlike many of the powdered drinks; Science in Sport's GO!, High5's Isotonic, Gatorade, Isostar, PowerBar's HydroPlus, etc, these products don't include much or, indeed any, carbohydrates. The rationale behind this is that you can regulate your hydration independently of your nutrition: on a short event you'll just take the hydration. For a standard distance event where you expect to be over that magic two hour mark you'll take the hydration plus a couple of gels and for an endurance event you'll be taking a whole nutritional strategy along with you anyway... ...won't you? What you need is an easy way to ensure that you're getting the right water/electrolyte mix regardless of the amount of carbohydrate you're taking on board. It's an interesting idea and one that was pretty much pioneered by Nuun, a company created by Tim Moxey who is probably better-known for his blueseventy wetsuits. The idea is a simple one; put what you need into a small, easily dissolved tablet and then add that to water to ensure a constant source of fluids and electrolytes. You can carry the tablets in your pocket or 'bento box' and pretty much any race worth doing will provide water - those doing long training rides will be stopping to fill bottles anyway at petrol stations, friendly pubs and the like. As with any good idea there are bound to be imitators and competitors along pretty soon and this one is no exception. First out of the blocks was a product called Zym, there's another variant from Camelback aimed at the hiking/adventure sports market and there are a couple of 'quasi-hydration' products from Isostar and Motortabs. What follows is a completely subjective view of the contenders which is based on using them over the past few months - there's no science here, just personal assessment. Nuun launched with three flavours; Lemon/Lime, Citrus and Tri Berry and then introduced it's more radical Cola flavour just over a year ago with a new Ginger/Orange arriving in shops as you read this. There are other new flavours on the way plus a whole spin-off line called 'u' which is all-natural and aimed more at the female non-enduarnce sports market. All the products come in plastic tubes containing 12 tabs, each of which makes 16oz/500ml. The fundamental philosophy behind the product is that all it does is to provide you with hydration and electrolytes, there's no carbohydrate in there at all (or at least none that's worth counting). This means that you can convert a bottle of water into a properly balanced electrolyte drink that your system absorbs really quickly without any bloating. You take care of the carbs by using gels, bars or whatever takes your fancy - there's no juggling between what you got in a drink and what you ate. The tabs are small enough that you can slip a few in your pocket for a ride (wrap in foil or film as they just love water...) and it means you can mix up the flavours so you don't get bored - and the flavours are very light so you don't get a taste overload either. It takes about three minutes for a tab to completely dissolve and the resulting liquid is completely clear and any tiny bits in it are just the inert 'filler' so aren't of any concern. Interestingly the colour, which is quite pale anyway, tends to fade almost completely over an hour or two in daylight - not sure why, it just does, possibly because it's a natural dye. So, what else is in there? The label lists; citric acid, sorbitol, sodium bicarbonate, natural flavours, potassium bicarbonate, magnesium sulfate, sodium benzoate, polyethylene glycol, ascorbic acid, acesulfame potassium, calcium carbonate, riboflavin-5-phosphate. We've been using the product for two seasons now and cannot think of a single bad thing to say about it (although for some the Cola flavour is a subject of some debate) - it really is worthy of a Tri247 "A list" award. 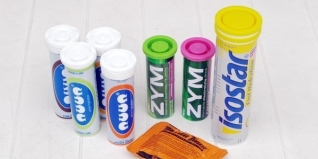 Zym is essentially an alternative of Nuun... ...except that it isn't quite! Originally available in LemonLime flavour, there's now a new version called Catapult which is Berry flavour and contains caffeine and guarana, but the differences go a bit deeper than that. The tabs are about the same size but come in tubes of ten. Where a Nuun dissolves completely to a clear liquid in three minutes, a Zym tablet takes at least five minutes and leaves behind a slightly cloudy liquid which takes a long time to clear. 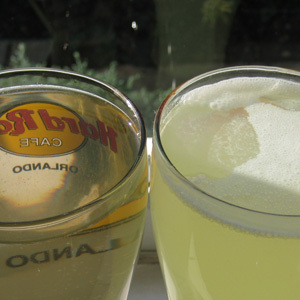 Even more unsettling is that if you dissolve them in a clear glass to see what's going on you'll find a 'scum' on the surface and a white deposit around the rim of the glass. Now, we know that this is the inert filler in the tab which is being deposited there by the effervescent action that breaks the tab down but it just doesn't look good. We have asked the Zym importers on two occasions for an explanation of why this happens but nothing has been forthcoming. Although we like the idea of Zym, just as we like the idea of Nuun, there's something about it that just doesn't quite seem to deliver the same results. The taste is not as light or clean, there's a definite twang to it that isn't natural, and there's that issue with the tab not dissolving to a clear liquid. If it's a choice between plain water and plain water with Zym then we wouldn't hesitate to use it - but if there was a choice between it and Nuun, no contest! The Catapult product has a different formulation and packs in 200mg of Guarana and 100mg of caffeine but loses the carbohydrate (although the ingredients list includes maltodextrin and sucralose (the American for sucrose) the nutrition facts say that there's no energy in it...). The issues with the flavour and the dissolve still seem to apply to the new variant but we haven't exhaustively tested it to see whether the Guarana/caffeine supplement adds enough of a buzz to make it an alternative to using a caffeinated gel or cola. In theory this ought to be a better system as you are getting plenty of fluid, no empty calories (in the case of a cola drink) and you can still take a plain gel for the carbs. As a way of demonstrating the difference between the way Nuun dissolves and the way Zym dissolves we dropped a tab of each into an identical glass of filtered water and waited three minutes. Given that this article is about hydration and is looking at products that come in tablet form, you could be forgiven for picking up a couple of other products off the shelves. 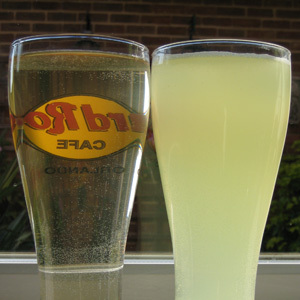 Both seem to be majoring on their value as a hydration aid but both carry a hidden payload; carbohydrate. Actually, it's not hidden at all - one glance at the package will tell you that this is a definite case of 'supersize me'! Long before either Nuun or Zym appeared on the market there was Isostar and its Power Tabs. Compared to the size of a tube of Zym, both contain ten tabs, you'll realise just how bulky carbohydrate is! And it's a bigger problem than that - you need two Power Tabs in a 500ml bottle... Although the label says 'Fast Hydration' there's a lot of energy in there as well - about 9.5 gm per 12gm tab is the carbohydrate load. The ingredients list goes: dried glucose syrup, citric acid, sodium hydrogen carbonate, natural lemon flavour, maize starch, potassium carbonate, magnesium carbonate, calcium carbonate, salt, calcium phosphate, maltodextrin, Aspartame, Vitamins C, E and B1. If you are looking for an easily portable isotonic energy drink and lugging bags of white powder around isn't an option then Isostar have effectively taken their well-established bulk mix product (you are restricted to the same two flavours, Orange or Lemon) and compressed it into a tablet for you. It's a neat idea and it definitely delivers but it puts you right back into the situation of combining hydration and nutrition in one product - which is where we started out looking for an alternative! The ingredients list for a Motortab is as follows: dextrose, sucrose, maltodextrin, citric acid, polyethylene glycol, natural and artificial flavours, sodium benzoate and F&DC red#40 (a colouring). In addition, each tab loads 250mg of sodium (from sodium bicarbonate) and 75mg of potassium (from potassium bicarbonate). There's a legend that this formula mimics the original Gatorade product but a quick comparison of the nutritional information across the ranges suggests that this is probably more urban myth than reality - although there is a certain similarity in taste but we suspect that's more to do with American palate than anything else! Hopefully this article will have made you aware that hydration is a far more important topic than you might have realised and, while the majority of thought is given to the fuel you'll be taking on, you need to spend at least some time planning your hydration strategy. In our opinion it is often easier to separate hydration from nutrition to ensure that you are managing both in an optimal way - and that means drinking a carbohydrate-free electrolyte mix and ingesting your carbs as either bars or gels. In that way you'll know exactly what's going in every time you open your mouth to fuel up. It's also a neat way to get around the taste boredom of a long session or race; you can mix up the gels/bars and you can mix up the hydration tabs - although you may get the odd 'Marmite moment' if you don't choose your flavours carefully!